Return address labels can add an attractive finishing touch to your outgoing mail while making your everyday life a little easier. Maybe you feel like this sort of thing is an unnecessary luxury for lazy people. Why pay for labels when you can always write your name and address on all those envelopes, right? Being thrifty is a quality we admire. However, your time is just as precious as your pennies. 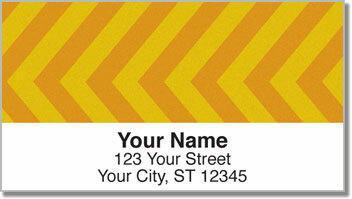 Because these are self-adhesive address labels, the only thing you have to do is peel them off and stick them on to anything you put in your mailbox. You'll eliminate a tedious task while giving your mail a professional appearance - and all at an affordable price! Order your very own Diagonal Line Address Labels today! Get them with a set of matching checks.